Take your beer with you when you go to the beach, camping, a game, or to a party. Our Mini C02 System is lightweight and portable, and combines the precision of a full sized C02 regulator with the compactness of a simple air pump or C02 injector. 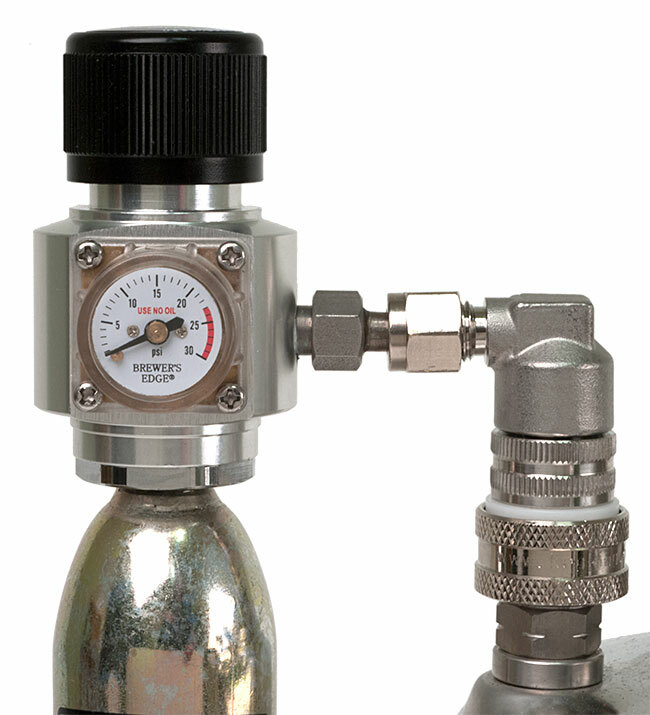 Our Ball Lock Mini Regulator takes Brewer's Edge 74 gram C02 cartridges (with standard 5/8-18 NPT threads), which hold enough gas to dispense a carbonated 5 gallon ball-lock keg. Features a 0-30 psi C02 regulator that features precise adjustment via the calibrated top adjustment knob. With this 0-30 PSI model, you can both dispense and force carbonate. Fits ball-lock kegs and includes the pictured stainless ball lock keg connector. The flared outlet on the side that goes to the stainless ball lock fitting can be unscrewed and leaves a 1/8" female NPT port. Into this port you can screw any 1/8" NPT male thread hose barb or threaded outlet (such as our item I80). The regulator does not include a pictured cartridge, you will be offered a chance to order these when you put this in your cart. Note that C02 cartridges cannot be shipped by air or express, and cannot be shipped outside the lower 48 states due to aviation and postal regulations. FOR C02 ONLY: This regulator is designed for use with C02 only, and should not be used with higher pressure argon or nitrogen gas. Have had frequent problems with setting and holding pressure. Have done repairs recommended and have not had good results. Ordered two of these regulators for a portable barrel kegerator I built. Since space was tight I chose this as my delivery method. Worked excellent and was easy to use. The dial for the regulator real sensitive but, stays at it's setting when dialed in. I would definitely recommend getting one. I got plenty of compliments on my kegerator and easy to use set up. Great product. Cheers!!!! I use this with the cartridges and the paintball adapter and no longer have to drive to the fire extinguisher service shop to get C02. Accurate and easy to use. Subpar product. I had high hopes but it really didn't deliver. The compact size is great, but the unit I received was really finicky when trying to dial in the pressure I wanted, and wouldn't hold it for very long once it was set. Sending it back. William's Brewing Responds:  This sounds defective. Send it back and we can replace it or refund your money. This item, D74, comes with the regulator and right-angle ball lock connector as pictured? Thanks ! Could you buy an adapter to allow this to work with a normal Co2 canister? What size would you buy? No, this only works with C02 cartridges. Can this regulator be connected to a 5lb Co2 tank? No, it is setup to take threaded C02 cartridges only. Will one CO2 cartridge force carbonate a 5 gallon keg to 2.5 vol? Assuming no leaks in any equipment, figure one 74 gram cartridge will carbonate to 2.5 volumes and then be exhausted. You will probably need to tap another 74 gram cartridge to dispense the entire keg once carbonated.